I really like gadgets and I confess that I’m a sucker for the “As Seen On T.V.” industry. A couple of years ago I was smitten by the Pocket Hose Top Brass. This remarkable invention promised to prove to be the last water hose I would ever need. Without hesitation I bought one and used it for the next two years. While watering some plants that Mary had recently set out, I discovered the truth about the hose. This “last hose I would ever need” suddenly burst through the outer casing, and looked like a fully fed snake about to explode. Laughing it off and continuing to water the shrubs it was only another moment when it did explode and my once greatest gadget had to be placed into the rubbish heap of fallen hopes. One of the most common pitfalls of life is that we have an over inflated view of ourselves and an under inflated view of God. Too often fallen humanity assumes that our life is all about us and the things we want, crave, desire, and lust after. This egocentric view is solely based on the false sense of self-importance and self-sufficiency. Our overfilled egos will lead us to the rubbish heap of fallen hopes. 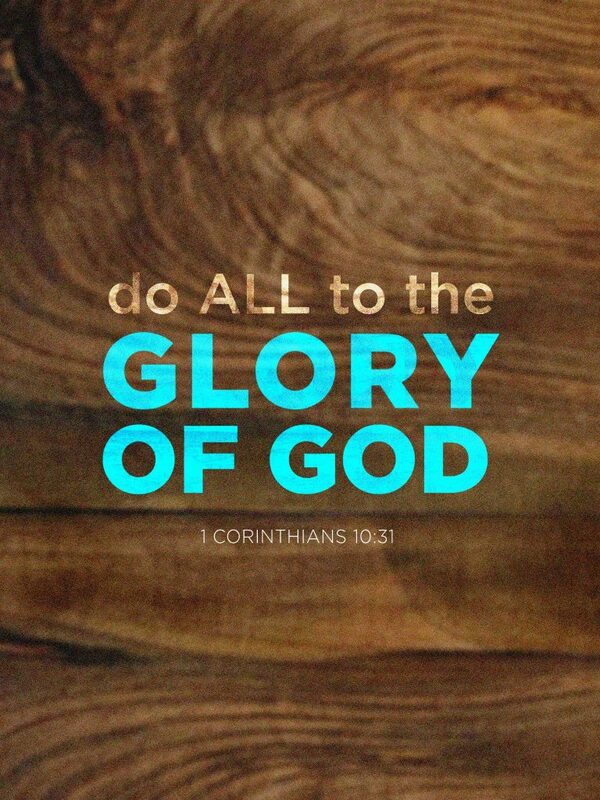 This week’s scripture verse gives a simple reminder that we should do all things for the glory of God. Someone might remark, “You don’t know what my life looks like today” to which I reply, “but God does!” Any Christian who is living in discontent because of his job, his family, his finances, or any other thing, is living out a terrible testimony about the goodness of God. Is the God you serve sufficient for you in your circumstances? Paul’s constant theme of his writing is that every true child of God has the absolute assurance of His sovereignty, sufficiency, and supremacy in and through all things. Remember, as you memorize this verse of scripture that we can give glory to God through praise, persistence, and perseverance.